On Tuesday morning, Betty Bliss passed away peacefully at the age of 98 years. She will be forever loved and remembered by her son Doug (Maureen) Bliss and their children, Bobby (Lindsay), David, Danny; son Don (Renee) Bliss and their children, Lori (Dan) Gnenz, Jamie (Rebecca) Bliss, Christina (John) Omoyayi, Sean Bliss,; daughter Moira (Emil) Chyzowsky and their children, Michael Chyzowsky (Jill Fusco), Miranda Chyzowsky (Nadim Daban); as well as 8 great-grandchildren. Betty was born on November 26, 1919 and lived in Manitoba. While attending Brandon College, she found her Bliss when she met Eldon. They were married on April 11, 1942. Just months later, Eldon went overseas. When he returned after the war, they moved to Alberta and started their family. They lived in many small teacherages in tiny towns until they finally settled in Edmonton. 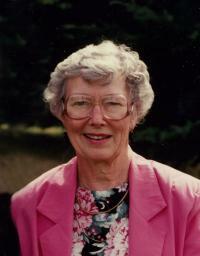 Betty loved playing bridge, painting and did volunteer work. When Eldon retired, they spent winters in warmer climates and summers at Moose Lake. Together, they golfed, gardened, read, swam, canoed and mastered happy hour with their incredible group of friends. Laughter and fun followed them everywhere they went. They both had a love of life and being outdoors. Since Eldon passed away, Betty managed to stay positive and continued to live her life with dignity and gratitude. She daily commented on how lucky she was and what a good life she had. Thank you to the staff at the Allen Gray Continuing Care Centre for making her last eight years so enjoyable. She often told us how thoughtful and kind everyone was to her. Donations in Betty’s memory may be made to the Stollery Children’s Hospital Foundation, 800 College Plaza, 8215 112 Street NW, Edmonton, AB, T6G 2C8. There will not be a service at this time. Instead, we will arrange a Memorial for both Eldon and Betty in the Spring.